Proper brushing of teeth is very important not only to maintain good oral hygiene but also to enjoy food, smile and talk confidently. Your oral health depends on various factors like, choosing the right toothbrush, brushing techniques and how often you do it. Poor dental care, could lead to dental infections that can cause serious problems. Read this article to clear your doubts about brushing your teeth. Bristles should be of rounded tips, as sharp bristles can damage sensitive tissues in gums. Handle of the toothbrush should be long enough so that you can brush comfortably. Select toothbrush that has small head as it can easily reach all the places in your mouth. For clean gums and teeth, proper brushing is essential. Make sure the toothbrush you use has soft bristles. Clean the outer surfaces of the upper teeth, followed by lower teeth. Clean the inner surface of the upper teeth, followed by lower teeth. The chewing surfaces should be cleaned. Properly brush all the sides of the teeth. The tongue should also be cleaned. How often brushing is required? Dentists recommend brushing of teeth twice daily or after every meal. Make sure you don’t brush your teeth for more than 2-3 minutes. For keeping your teeth clean, brushing techniques should be followed, so that the enamel of the teeth is protected. How often a toothbrush needs to be changed? Many dentists recommend to change toothbrush once in three months. Toothbrush that is being used for a long period tends to contain germs that can cause problems like diarrhoea and skin infections. 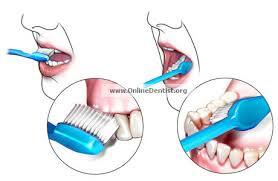 A toothbrush should be changed more frequently, say about once in 4-6 weeks. If you have cold or any viral infection, it is better to change your toothbrush, as germs may be transferred to your toothbrush. Wash and rinse your toothbrush with hot water after each use. After rinsing, let the toothbrush dry as bacteria tends to get settled quickly on moist surfaces. Make sure that you are storing your toothbrush in upright position rather than keeping it in lying position. If your toothbrush is similar to one of your family members toothbrush, then better to mark it with a marker, so that you can identify your toothbrush. Avoid keeping all the toothbrushes of your family at a place, as there are chances of bacteria or germs getting swapped from one toothbrush to another. This entry was posted on Friday, October 18th, 2013 at 7:18 am	and is filed under Dental Health. You can follow any responses to this entry through the RSS 2.0 feed. You can skip to the end and leave a response. Pinging is currently not allowed.